Personal Essay, art and poetry on life, love, the human condition, and special needs parenting. There was something about the late September sky and the clear day–the sea of blue interrupted only by clouds of fluffy white juxtaposed against newly wheat-colored grasses. It was like an expansive ocean washed across the sandy beaches of land. Warm breezes blew rustling the drying grasses and harkened change. Every year I welcomed September with excitement and trepidation; and as the sun tickled my nose and I drank in the firmament I knew this year would be no different. The time expired on my brief contemplation of the beauty of autumnal awakening; the door creaked as I wrenched it open, hands over-full (as usual), little voices came back into focus flinging the word vomit in my direction. My head swam through the expanses of crystal azure above cut through only by the dark asphalt scar I drove down to our next therapy appointments. Shoot. I was caught out. He was talking and it was all muffled Charlie Brown teacher like. He resumed the machine gun word fire and my head continued to swim as we pulled into the parking lot to split up. My husband waited to take one kid to one therapy as I took the other to another. We unloaded, arms overly full again, save for a few fingers for sister to grab as we traversed the parking lot. The smell of apples was in the air. “Mommy, you heard me right?! We can do all that for my birthday?” he said. We exchanged quick hugs and kisses as he climbed into the car seat in my husband’s car. The husband and I said a quick hello and an even quicker goodbye; only enough time spent together for a graze of each other’s hands to meet–not even a hug or kiss. I retook sister’s hand in mine and breathed deep; smells of apple and dry grass filled my lungs. And, I was transported back. God, I love and hate September. As I breathed in, the smells carried me back to the carnival, belly round with baby, and toddler in tow. She was dressed in bright pink pants and a chartreuse shirt that hid the Holter monitor (heart activity monitor) attached to her chest–cheeks chubby and slightly chapped (from teething and messy food)–as she rode in her brown stroller. It was the last weekend we spent as a family of three. I remember it viscerally; the sheer terror mixed with unbridled excitement and joy–wild and bright like the September sky. We sat her on a bright red tractor to take a picture and to let her play with the steering wheel and buttons. Suddenly she was slumped over on one side and rigid on the other, arm slightly shot up, and I rushed to press “record event” on the box attached to my bionic baby while making sure to hold her so she didn’t fall off the tractor. I whispered a silent prayer to the cosmos, because by then Tuberous Sclerosis Complex (TSC) had stolen any belief in an omnipotent and benevolent being I had left, that it really was “just” her heart and some weird kind of fainting episode. My gut knew better. These were seizures. Seizures of the worst variety–infantile spasms. Panic suffused my being: How was I bringing another life into this chaos? What if the baby squirming around my now tightly compacted abdomen was also born with this devastating rare genetic disorder? We had all the testing done and knew that our beautiful girl’s case was a spontaneous mutation; a base pair deletion on her 16th chromosome with a frame shift. A completely random slip up in her DNA that made it like her cells were dialing the wrong phone number–as though my body rang up a terrorist when it knitted her together in my womb. A 1 to 3% chance that it would happen again was what we were told by all the experts. He had been watched closely for signs by multiple peeks inside the womb as he grew. There were no signs. But, there was no trust when you unknowingly weaved a terrorist into the cells of your sweet baby girl. The world became topsy-turvy. There were landmines under bright red tractors at the local country fair. That was the world we were bringing him into. The door to the old farm house in which her therapy was held squeaked open and someone slipped by us as she squeed happily almost tripping them on our way through. I slid down on to the slippery cool leather of the couch and was again transported back. In the room, I stared out at the clear blue waves capped by clouds of white foam in the September sky, draft blowing through the back of my johnny gown mimicking the breeze rustling the leaves, and every cell of my being vibrated with fear. I had grown accustomed to living with a terrorist. In the startling quiet of the prep room, I steeled myself and time stood still; til it was shattered by the sweet sound of his shrill newborn scream. September breathed new life into me. She hopped onto my lap despite the expanse of couch that spread horizontally from me and turned back, as she so often does, to put her face so close I could feel the moisture of her exhale. Her face widened as she smiled, eyes squinted by the pudge of her cheek, and she examined me. 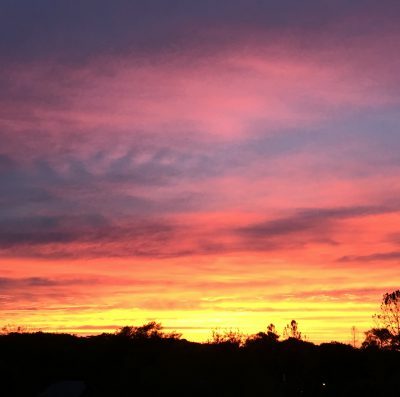 Therapy was over for the night, we were home safely, and the September sky was painted ablaze with the fires of sunset; the air in the house smelled soapy clean of bubble bath and the sound of giggles echoed off the walls. “Moooooommmy! It’s gonna be brudder’s burfday soon!” she shouted. He ran past milky skinned and rosy cheeked–still holding on to the cherubic looks of early childhood–and I was suddenly struck by the magnitude of my love for him. And, their love for each other. They ran through the house full of giggles and shouts challenging the dark corners, and the terrorists with in and with out. I contemplated how that love changed me and how I deal with those terrorists. It is a love so strong, “you did not know you were capable of feeling, primal and angry and powerful, you would kill ten men and Satan if you had to.” A love that looked a lot like bravery. Sometimes bravery is as simple as a smile. It is bringing a toddler, your belly round, to a carnival, despite her Holter monitor, your own fear in tow. It is birthdays and brothers. It is love. It is living along side the terrorists because there will always be something to fear. Bravery is living your life anyway. It is bath time and rosy cheeks. It is clear blue skies with fluffy white clouds and American flags blowing in the breeze because we will not let them take away our freedom. Bravery is living in the ambiguity–the never knowing if you made the right choices. It is having a second child after a tiny devastating deletion in DNA in your first. Bravery is quiet resolve. It is fear and love. It is primal, powerful, and angry–the will to kill ten men and Satan if you had to–or it is not. The chirr of crickets drifted in the window above me and reached through the dark for my ears. The pillow case scratched against my cheek, cheap and rough, and I lay eyes drinking in the darkness and waiting for sleep. My mind wandered through the solitude and I thought of the crickets; crickets who stringed their tune in loneliness–calling out–until their trilling hums united in a wondrous symphony that painted the soundscape of late summer’s night. My thoughts hummed in solitude like the lonely song of the cricket, and I imagined the thoughts of those lying eyes wide and sleep eluding painting the mind-scape of the night. All people’s reflections so very different–thoughts of longing, of love, of loss, of guilt, happiness, hope, of joy and sorrow–thought in the shadow of lonesomeness. Only the most precious, complex, and perhaps dangerous rumination are capable of robbing one of sleep; and we, the parents of the rare and extraordinary, are faced with such pondering often. Life for us is inherently isolating and lonely; it is lived at an incredible pace; the trumps and struggles are of such a magnitude that it bleeds into the solitary hours of the night. Rumination like a cat burglar snuck up on me, the unsuspecting victim, and stole sleep only to leave a pervasive state of underling fear and uncertainty. I was feeling especially lonesome and unsteady as of late. Both a cherished friend and some close family moved many states away, we made big decisions–such as the one to place one of our children in a self contained classroom–a change in school for both kids, and new diagnoses and ever shifting medical concerns for the children weighed heavy and left us more isolated than usual. Over the years, Tuberous Sclerosis Complex (TSC) and the other exceptionalities of my children have laid waste to my career outside the home, many friendships, our hopes for a bigger home, and more. When the kids were young, it was easier to still enjoy some of the same pleasures as parents of healthy, neurotypical children–playgroups and jaunts to the park–but as the years passed and she has remained frozen in time and development we are no longer able to assimilate in that which is built around the typical family as easily. Our life became more and more extreme–outbursts, prolonged hospital stays, severe financial strain of raising children with exceptional needs; and, the stress increased exponentially. As the stress increased, our ability to attend social events and lead outgoing, independent social lives outside our family became less and less–forget trying to find a babysitter! Our days were spent at therapy appointments and ABA, we missed birthdays and barbecues, let down friends and family over and over again. Some friends fell away, we were blessed to find some new, yet our world seemingly became smaller and smaller, lonelier and lonelier. I became like the solemn cricket singing out to the night sky in search of another of my kind. It was easy in the dark hours of the night as the warm September breeze blew out the summer and in the fall and the air settled like a heavy sadness to mourn it all in solemnity. There was truth to all of this and truth is never a singularity. For all that TSC and the extraordinary vulnerabilities of my children have taken, for all the isolation, I have also been bestowed many gifts. I was reminded of this as I listened to the symphonic harmony of the crickets; we have been gifted a camaraderie and community (among other things). Like the very image of waves driven in ink deep into the layers of my skin that connects me to the other parents of children with TSC who bare the same marking, though our stories may be very different, we gain strength from our connection and unity in our rarity. My thoughts shifted from my deep seclusion and the wreckage of the day–another school disaster, another betrayal by a person entrusted to service our child, and the havoc that rolled down the line–to the village of people who swooped in to help. There are times when I am buried so deep in the difficulties of our life that I fail to hear the chorus around me. In one day we had a caring new friend, who knows very little about our sweet children but has been open and accepting of us, alert us to the school issue, my darling best friend–my person–support us with calls and emails and legal research from her hurricane ravaged neighborhood many states away, and another dear person offer to make the cupcakes that I just won’t be able to make for our son’s birthday on Saturday. I am not alone. We are not alone; and we are alone. That is the crux of life. We are all simultaneously alone in our plight and surrounded by humanity. We are the solitary cricket chirring a call to his fellow cricket yet surrounded by the deafening cacophony of chirping in the dark summer’s night–alone and together. I settled in with a new recognition and appreciation for the deep and spreading roots of community we truly have; and, with an understanding that when I feel isolated, misunderstood, and alone in this rare and exceptional life that all I need to do is call on those connections. That I have people willing and able to rise to the occasion. And also, that call need not be literal or external; it can also be an internal grounding in the roots of community and the love that surrounds our family. Because, there are many times when I will still very much be alone in this and that is ok–alone and together. We are all so much more alike than different. We are all so much more valued and loved than we will ever know. We can all call on that in the darkest hours of the night–when the crickets hum, thoughts race, and sleep eludes. Rest peacefully in the chorus of community. The grass was long and uneven; weeds grew thick and straggly in the landscaping. The sight got under my skin like the tiny bits of hot sand from the driveway that worked their way in when I decided not to wear shoes to run and grab the mail. The asphalt burned underfoot; I concentrated on its heat to distract me from the messy exterior, but more so to distract me from the intensity swirling within. I wanted to tear at the plants, ripping them away until our house looked manicured again. I wanted to return inside to a home that was orderly and neat. There was a rising scream that filled my chest like the steam expanding in an over-full pressure cooker heated too vigorously, but it never escaped. Our life is unseemly and wild like the weeds that grew in fits and spurts crowding out the manicured beauty of the landscaping. It is hot and bothersome like the asphalt with little sand rock pebbles that pushed and singed. But none of that exterior change would change anything. In the end our fears are generally not about that which is without but that which is within. I fear I am not enough to parent the extraordinary and tame the wild. They are within me and with out me; I grew their tiny bodies inside of mine where they shed cells that will forever circulate within me. Our relationship is soft and silky yet impossibly strong like an invisible cord that tethers us to each other. I’ve relied on this bond, read the small telegraphing movements of the cord, since before they drew their first breaths. The bond is strong and primal, as old as the mother-child relationship itself. I trust our fettered souls. They have changed me at a fundamental level. Yet, I do not trust myself; that I am enough, that I can do enough, that I love enough, that I see enough, that I have fought enough, that I have done enough, that I will be able to save her. That I will be able to save her. The rising scream that filled my chest was born the day I was first introduced to her immense need—the words Tuberous Sclerosis Complex. When fear looms as large as the weeds ready to overtake my hedge, I must remember, that my tether is to my children and not the devastating and incurable disease that has ravaged our girl. There is no way for one person to be enough in the face of all of that. But, there is one thing that is enough in this world and that is love. It is that which wove the cord between us. If only I breathe and approach it all with love the fear will lessen; and someday I will feel safe enough to release the sobbing scream that keeps me chained to the fear.